An industrial control system (ICS) is an interconnected system of component configured in a way that provides desired system response. Control system is a relationship of input and desired output. For the simplified industrial processes ICS has been developed and is continuously being upgraded to eliminate the flaws and improve the efficiency of the system. Various control strategies are implemented as per the process such as open-loop control and close loop control system. An example for open loop control is, turning on and off the motor that operates a pump that fills water in a tank. ICS is adopted by various companies and governments for the security and automation purposes. The automation of the control system directly impacts the profitability of a business. For example, to enhance the competitiveness of Mexico’s Federal Electricity Commission (CFE), the smart grid project is ongoing, which will require the effective implementation of control system in the transmission and supply of electricity. Mexico being a developing country becomes one of the most attractive markets in the world for the growth of industrial control systems market which facilitates large number of developmental activities such as improving transportation, developing power and energy industry, growing number of manufacturing units across various industries. Goldstein Research analyst forecast that the Mexico industrial control systems market size is set to reach USD 2.4 billion by 2025, growing at a CAGR of 8.31% over the forecast period. 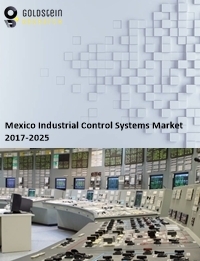 Factors such as growth of various industries across the world, technological advancement in the control system, implementation of smart solutions and rising investments are the impacting the growth of Mexico industrial control systems market. The report covers the present ground scenario and the future growth prospects of Mexico industrial control systems market for 2017-2025 along with the Mexico sales and Mexico revenue of industrial control systems market. We calculated the market size and revenue share on the basis of revenue generated from major players across the globe. We have forecast the market on the basis of expenditure made by the companies/government in implementing the control systems. On the basis of End-user, manufacturing industry accounted for largest market share of 28.71% in 2017 of Mexico industrial control systems market. Manufacturing industry has multiple processes that require automation and monitoring of the processes, which is facilitated by ICS. Further, based on the application of ICS, industrial security is the major aspect for the growth of a business and over the forecast period it is expected to grow at a CAGR of 8.78%. Mexico Industrial control systems market outlook 2017-2025, has been prepared based on an in-depth market analysis from industry experts. The report covers the competitive landscape and current position of major players in the industrial control systems market. The report also includes porter’s five force model, SWOT analysis, company profiling, business strategies of market players and their business models. Mexico industrial control systems market report also recognizes value chain analysis to understand the cost differentiation to provide competitive advantage to the existing and new entry players. The new phase of ‘Industry 4.0’ consists of smart industries such as smart grids, which work through internet of things (IoT), cyber-physical systems communication among each other and with the humans and cloud computing technologies. Industry 4.0 is the new trend in the development and advancement of an economy and thus, it is expected to have significant impact in the escalation of Mexico industrial control systems market. The growing demand of industry processes security and efficiency is the major driving factor in the growth of Mexico industrial control system. The growing manufacturing and production industries are inclining towards automation of the system, thus increasing the risk of cyber-attacks and machine breakdown, which calls for the installation of the ICS and increase the productivity of the operations. The developers of industrial control systems are facing the challenge to control modern, complex and interrelated systems such as security system, traffic control systems, and robotic systems. The rising complexity requires for continuous up gradation of the control system, thus increasing the cost of its implementation. Based on geography, Mexico is witnessing huge investments for the development of transportation networks, agricultural produce industries and chemical industries among others, which have opened up huge opportunities for the installation of industrial control systems and fuelling increasing in productivity of industries. Mexico Industrial control systems market report comprises of the following companies as the key players in the industrial control systems market: ABB, Honeywell, Siemens, General Electric, Cisco, Symantec, Fortinet, Kaspersky, IBM, Booz Allen Hamilton, Citrix Systems, Brocade Communication Systems, Computer Science, EMC, F-Secure, L-3, Trend Micro, Kasa, Accenture, Exida. What is the revenue of industrial control systems market in 2016-17 and what would be the expected demand over the forecasted period?